Rated M. Starring Tom Cruise, Olga Kurylenko. Available now on DVD & Blu-Ray. It might not be the intention behind the film’s title, but the latest Tom Cruise post-apocalyptic sci-fi adventure seems to spend more time on surprises than it does on an actual storyline. Set in the year 2077, the earth has been all but destroyed by a war between humans, and aliens called Scavengers. Humanity won. But unfortunately, the nuclear weapons used against the Scavs rendered earth uninhabitable so the remaining humans nicked off to Saturn. Tom Cruise plays Jack (have you noticed Jack is the action character name of 2013?) the last drone repairman on earth, who keeps things in order while flying around in what resembles a massive iPod docking system. Oblivion is an enjoyable adventure but director and writer Joseph Kosinski (Tron: Legacy) throws in more twists and turns than a game of snakes and ladders – all at the expense of the plot and character development. The visuals are exciting though. Everything from the bare decimated landscapes to Jack’s floating home in the sky stamps our passport to this world of the future. And the soundtrack by band M83 is excellent. There are elements of 2001: A Space Odyssey and even WALL-E here. But the film still manages to find its own identity. As the film unfolds (to explain in detail would result in spoilers) Jack discovers relics of the world that once was – including the Empire State Building, and a Superbowl stadium. But it’s all left in ruin and almost unrecognisable. The reign of decay in our world is something the Bible speaks clearly about. Perhaps not in the way of nuclear warfare, but compared to God, this world is fleeting and destined to perish. God is solid and unchanging and his good rule will last forever and never decay. In Oblivion, the earth is perishing, so humanity flees to another planet, but that one is perishing too! We can find joy in the fact that our God is sovereign and unlike the things of this earth, will never change. Oblivion is an ambitious film that intentionally throws pieces of the puzzle all over the place but doesn’t give you a whole lot of time to piece them together. I’m giving it 3 out of 5 stars. 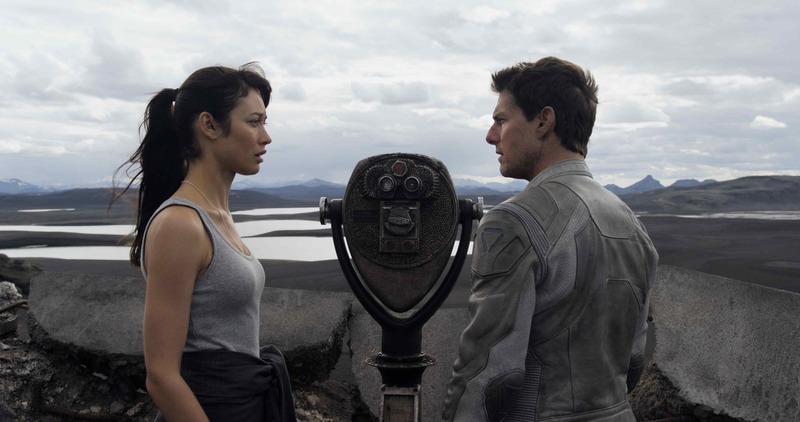 Posted in 2013, Film ReviewsTagged christian, film review, Joseph Kosinski, M83, movies, Oblivion, Tom Cruise, tron legacyBookmark the permalink. Thanks for the reply Joe. I missed Man of Steel at the cinemas but will review it when it comes out on Blu-Ray and DVD. Keep an eye out here or facebook.com/reelgospel for that.